Participants take photos on the sidelines of an indigenous peoples gathering on Sumatra island, Indonesia, March 17, 2017. The face of Indonesian President Joko Widodo was splashed all over posters for the fifth Congress of Indigenous People of the Archipelago (KMAN V) ahead of its convention in North Sumatra this week. But the president, commonly known as Jokowi, suddenly canceled his appearance at the event, which convenes every five years to set its policy agenda and elect the leadership of the Indigenous People's Alliance of the Archipelago (AMAN), which organizes KMAN. His absence and other grievances have some at the congress saying the movement for indigenous rights is at a breaking point. Several participants scoffed at Jokowi's conciliatory invitation to all the indigenous leaders present to visit him in the presidential palace on March 21. "What's the point?" said Ruuka Sombolinggi, advocacy coordinator of AMAN. "We are not children, we will not be impressed by the president's house." Jokowi's cancellation was the latest hiccup in indigenous Indonesians' struggle for recognition and legal protection. A bill to protect their rights has languished for years in a back-and-forth between Indonesia's House of Representatives and the government. Indigenous rights activists had hoped that having the president at the congress would add momentum to their cause. Now, as the congress shifts gears into internal politicking — to elect a new leader over the weekend — activists worry that their taxing struggle for indigenous rights has stalled again. Indonesia recognizes more than 1,000 ethnic groups scattered across its 17,000 islands, and between 50 million and 70 million people are considered to be members of indigenous communities. The indigenous people are often called "masyarakat adat," or people who use adat — customary laws. But there is no real word in Bahasa Indonesia for "indigenous," which points to how contentious the category has been in recent decades. 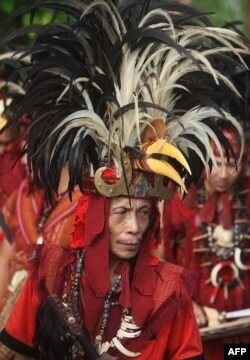 A tribesman from Indonesia's Sulawesi island, clad in traditional hornbill headgear, participates in a gathering for indigenous communities in Tanjung Gusta, North Sumatra, March 17, 2017. The congress of indigenous leaders in Tanjung Gusta comes at crucial time for Indonesian tribespeople, as they push the government to move faster to protect their ancestral homelands. One common refrain in the country is that "all Indonesians are indigenous," which is to say, they originate from the geographical area they currently live in. As late as 2012, then-President Susilo Bambang Yudhoyono denied that any indigenous people existed in Indonesia. But by the time Jokowi was campaigning for president in 2014, he could openly discuss a plan to support indigenous people. "We really hoped that this event would open the government's eyes to the diversity and power of Indonesia's indigenous peoples," said Mona Sihombing of AMAN. "And among other things, we wanted officials to see what a huge voting bloc this is." On Friday morning, a presidential spokesperson said that a long-promised task force on indigenous issues was no longer a priority, saying that it seemed like an unnecessary hassle given the option of "concrete" actions such as divesting "12.7 million hectares" of forests to indigenous ownership. "This is the first time we are hearing this position on the task force," said Ruuka. "Until today, the president's team has said on many occasions that the task force will be a big part of its indigenous policy." Later, Noer Fauzi Rachman, a presidential spokesperson, clarified that the task force was not entirely canceled, but its creation was just held up by bureaucracy. "If it were up to me, the task force would have been created last year," Rachman told VOA. "Although he can try to influence the various ministries involved, the timeline at which these things happen is not up to the president." On Friday afternoon, indigenous leaders reacted with dismay to the president's cancellation. Alex Sangenafa, from Yapen, West Papua, delivered a high-volume, impassioned diatribe in front of the conference's main stage, expressing his disappointment. He approached a presidential spokesperson with eight enormous wooden arrows, symbolizing the eight-month deadline by which he hoped the indigenous people's law would be ratified. 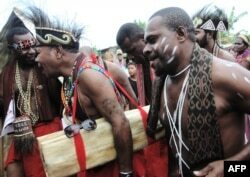 "We Papuans came out of the woods" to vote for Jokowi, Sangenafa said. "We are confident that he comes from humble folks and sees the pain of his people." His gesture was met with roaring applause. "I'm not angry, I'm disappointed," he told VOA later. "The suggestion that we should visit the Presidential Palace next week is beside the point," said Apai Janggut, an indigenous leader from Putussibau, Kalimantan. "As far as I was concerned, this was the absolute deadline for the government to effect change for our community. They have shown their priorities and we will vote accordingly." Tribesmen from Indonesia's Papua island participate in a gathering for indigenous communities in Tanjung Gusta, North Sumatra, on March 17, 2017. The president sent Forestry Minister Siti Nurbaya in his place, and she announced plans to release 7,000 hectares of forest in Toba Pulp Lestari in North Sumatra back to indigenous ownership. Handing the management of certain forests over to indigenous groups has been a cornerstone of the administration's indigenous policy. It dates to a Constitutional Court ruling from 2013 that "customary forests" are not part of state-owned forests, which set a precedent for transferring their ownership. In December 2016, Jokowi signed over 13,000 hectares to nine indigenous communities across Indonesia. Activists argue that at least 8.2 million hectares in Indonesia should be in indigenous hands. "The announcement of 7,000 more hectares in indigenous hands is certainly a good thing," said Abdon Nababan, a Batak person from North Sumatra who is the outgoing president of AMAN. "But between December 30, 2016, to the present, nearly four months, we've received a grand total of 20,000 hectares ... it's just too slow, no? Out of the millions ... that should be in our hands." Nababan cited corruption, manipulation and carelessness as reasons for the slow federal action on indigenous rights. "This is simply not progress," Sombolinggi said. She considers the back-and-forth between the House and federal government as "part of their game to avoid really addressing indigenous peoples. It's like pingpong." In its early years, AMAN often took an adversarial stance to stand up for indigenous rights, which were a touchy subject in the early years of the Indonesian republic. Sombolingggi said the recent stasis may spark a return to form. "We are at a crossroads," she said. "We have to decide whether to engage further, continuing the 'polite dialogue,' or become more confrontational."